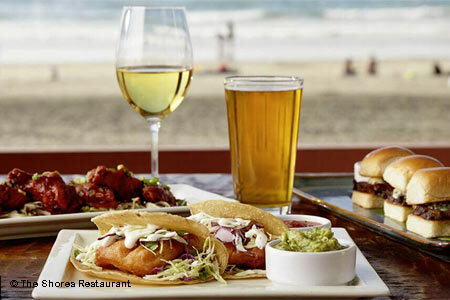 Beachside dining that spotlights treasures from the sea in La Jolla. : The Shores is a family-friendly restaurant with a view of the Pacific. People stroll up after a day at the beach to enjoy casual seasonal cuisine and tropical cocktails. Sit in one of the beachfront booths and watch the sun set as you dine. Notable San Diegan Bernard Guillas brings his talents as executive chef, while Percy Oani helms the kitchen. Lunch calls for black kale salad with tart cherries, lemon-ginger chicken noodle soup or Cabo tacos with beer-battered Baja fish. Seafood dominates the dinner menu, with dishes such as five-spice sea bass, seared diver scallops with edamame succotash and bacon jam, and shrimp with sweet corn risotto. Desserts are rich and playful, especially the cookie dough mud pie. Enjoy Sunday brunch on the patio, featuring mimosas, omelets, and the crashing surf as a soundtrack.